In the most recent update to Google Calendar, Google finally made reminders a centrally functional feature across a variety of Google apps, including Calendar, Inbox, and Keep. Before this update, there was a chance that a reminder set in one app wouldn’t ever make it into another app and your chances of missing it or forgetting about it were likely. While this centralized reminders control is awesome, attempting to find a complete list of reminders, including both current and past, has always been somewhat of a chore. In fact, the only ways I can think of to pull up a list is to say to Google, “View reminders,” set a reminder and then hit the “View reminders” button shown after completion, or swipe into Google Now, then swipe out the side menu and choose “Reminders.” Why there isn’t some sort of dedicated Reminders widget or readily available shortcut is beyond me. Well, there is actually a shortcut, it just isn’t exactly all that easy to find, from what we can tell. 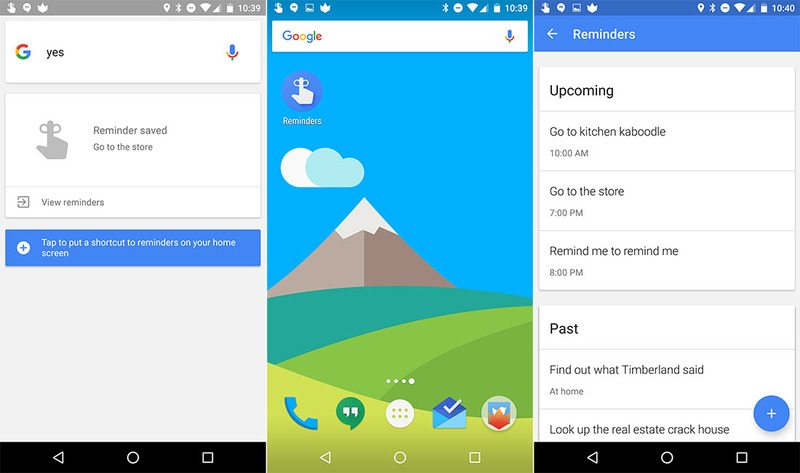 Yesterday, one of readers spotted a prompt to add a home screen shortcut for reminders after he set a reminder. You can see it in the screenshot above and below. To access this shortcut, since it doesn’t appear to be a widget that is listed in the system widgets list that is accessed from your home screen, you need to set a reminder in the Google app. Once that reminder has been set and confirmed, assuming you are running the latest versions of the Google app and Google Now Launcher, you should see a blue bar below your reminder that asks if you want to add a shortcut to your reminders (see above). Tap that button and the shortcut will appear a few seconds later on its own home screen. This does indeed create a shortcut on your home screen to all of your reminders. By tapping on it, you can see a list of your reminders, both current and old, edit them, refresh them, etc. It’s super handy. Unfortunately, this shortcut is almost impossible to get on your home screen. As I mentioned above, setting a new reminder seems to trigger this blue box prompt some of the time. It may only show if the Google Now Launcher is your default. It may also only show up a single time before going away. For example, I set it up, then removed it and tried to replicate the process and can no longer get the prompt to display again. It’s not listed as a shortcut or widget in the widgets list. I couldn’t even find it by adding a Nova Launcher shortcut that digs through system shortcut lists. The only way I could get this box to show up, was to have the GNL as default and set a reminder with my voice in the Google. But again, once I tapped the button once, it never showed up again no matter what I tried. Anyways, I’ve typed way too much about such a silly little, mostly non-important feature. (“Slow news day, eh, bruh?”) But if you want a shortcut to all of your reminders, this is a way to do it! Woof. EDIT: If you know another way to set this shortcut in an easier way, I’m all ears…after I smash my head into a desk.